The question “If you had two extra hours in a day, how would you spend it?” is very tempting for most of the people. Often, we feel it would be great to have those extra hours to do something close to our hearts. Social commitments and our responsibilities, steal our time without even letting us realize it. When we do something we love and enjoy the most, ignoring what we should actually do, then the feeling of guilt starts gnawing at our happiness. People often feel they could do much if they had some extra hours in a day. May be because it is extra time we get, the guilt could be locked away when we do something we enjoy. But that is not possible. Our days are made of 24 hours and that is fixed. If we need some extra time to pursue a hobby, passion or spend quality time with our family and friends, the only way out is to stop wasting time. Time is precious. There are lots of inspirational stories written about how precious time is. One of them goes as the follows. A billionaire was rumored to be earning 1 million dollars every second. Once a person asked the billionaire “Is it true that you earn 1 million dollars every second?” The billionaire replied, “Let’s forget how much I earn. You can earn one million dollars every second if you can add a second to my 24 hours”. Everyone knows it is impossible to add even a second to the 24 hours we get every day. But often, we spend so much of time sleeping, lazing around or doing unnecessary chores. I am no different. 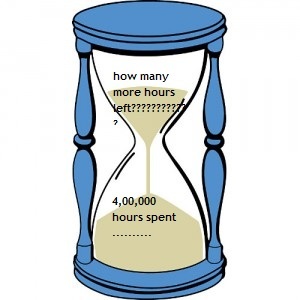 I have spent nearly 4,00,000 hours in my lifetime. How many of those hours have been spent fruitfully? How many hours have I truly enjoyed to the fullest? How many of those hours were filled with ‘WOW!’ moments? I cannot count much of positively spent hours in those 4,00,000 hours of time I have spent. After my marriage, most of my time was spent learning simple skills that I had ignored all my life. I was an expert in cooking special dishes like puddings, cakes, halwas etc, but I did not know the common everyday cooking which was always done by my Mom. Another hurdle was the change in environment. I had grown up in Bangalore, but after marriage had to shift to Byndoor; which is a small coastal village and quite different in many ways. I had to adapt to new food, clothing and way of living. Time was spent drawing water from well, sweeping, mopping, learning to cook sea food, washing clothes along with other tedious household chores which made me unhappy. My Mom always preferred particular brand of bath soaps, detergent powder, cooking oil, hair oil, shampoo, rice and many other products which had become a part of my life. Using local 555 bar soap with some kind of local light brown washing powder did not go down well with me. I would waste so much of time scrubbing the dishes and clothes. The cement floor also required lots of mopping. Change is not easy in an Indian village but then changing me was not easy either. One fine day I had to put my foot down and state that I will not compromise on the quality of products for the sake of price. Anyway it did not save much, because, you ended up using more of those products to clean up clothes and dishes. Also, eating unhealthy food makes you spend on doctor's bills and medicines which at times eats up more than you have saved. So, I was back with my preferred brands, but still had to do all the chores manually. 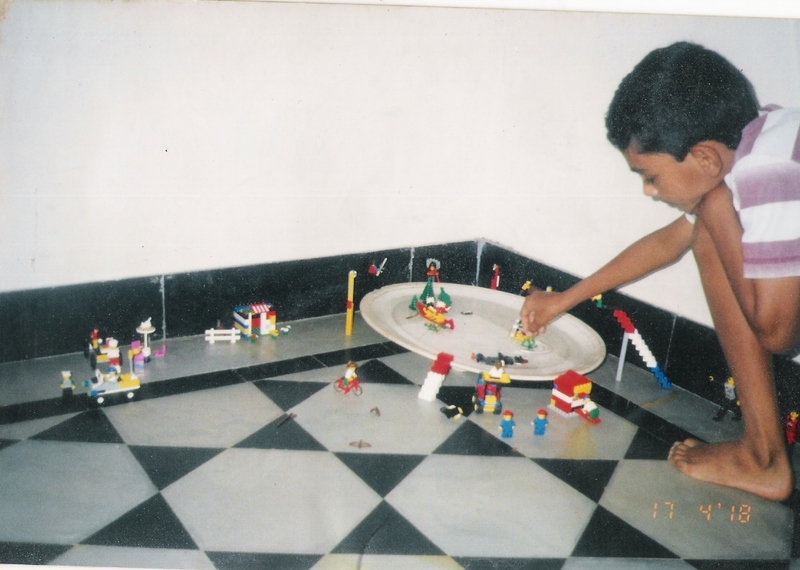 My childhood was spent trying to prove myself to my family in particular and the world in general. I wanted to be a topper in studies, sports and many other things, so that the handicapped girl tag would not carry on in my life. Due to my efforts I was successful, and no one thinks of me as a handicapped person anymore; but, at this stage of life I feel it would not hurt me if they did. All the fun was lost in trying to achieve something which I do not treasure anymore. My teen years were spent working hard on my studies, improving my behavior and trying to please my parents. I wanted to be an ideal daughter. So, I ended up being married and giving up studies for which I had worked so hard all my life. It was all confusing and I did not know what I was doing. My teens years were something where I had little control over the changes happening in my life. By the time I could think clearly and see the results, I sadly realized that all those hours of studying I did in my childhood and teen years were for nothing. It will not bear fruit, but then learning has never been wasted. Knowledge is wealth I can treasure forever. Buying a washing machine was easy but installing one took lot of changes to the house. We did not have overhead tank or running water so the washing machine had to wait till now. Just this October did I manage to finally buy a washing machine (Whirlpool, ACE) Whew! For the past 22 years I have spent a lot of time doing unnecessary household chores about which I am not happy. I wish I could have spent that time doing something worthwhile. I don't mean to say that caring for my family was not my duty or worthwhile. but then doing things the tough way and wasting precious time is what I regret. I have spent a lot of happy time with my kids. Those memories will be treasured forever in my mind. We have gone for long walks together, done lots of painting, enjoyed different games and have shared amazing stress free time together. Though being different is difficult, I cannot say I have been unhappy with my kids. I cannot say the same about my husband though. He works in gulf and we do not get to spend much time together. After 22 years of married life, may be I am more comfortable with this life-style and do not yearn for a change anymore. I don't yearn for some exclusive time with him at this stage of my life. I did when I was younger and may be I will feel it when I am older. After all the useless talk I still have the question from Surf excel matic, “If you had two extra hours in a day, how would you spend it?” unanswered. It is very tempting to say I would give extra care to my special needs daughter and teach her new words and activities. It is also very tempting to say I would love to spend some quality time with my husband or son. But those tempting sentences would not be true. Those would be the ideal words and sentences everyone expects to hear from me. Those would be the words I say because everyone expects me to say them and feel happy when I do what they expect me to do. When I look back on the path I have treaded in my life, I sadly find that ‘I’ have been the person who has got least attention, love, pampering and priority in my life. Though I spend all the 24 hours a day with myself, I have failed to care for my own feelings and emotions. If I could get two extra hours now or if have some hours left in my life at the stage when I find myself starting the last part of Life’s journey, I would love to spend it on myself selfishly. I would read all those books I have been putting off, I would watch my favourite movies all over again without being interrupted, I would play games without struggling to win them, cook food I enjoy, pamper myself with love and attention, AND I would continue my studies again. I have never regretted anything as much in my life as I have on giving up my studies. I always aspired to be an astrophysicist or psychologist. Astrophysics is out of my reach now but Psychology still holds hope. I have already finished two years of my graduation and scored quite impressive marks in psychology even without two extra hours a day. My aim is to do PhD in psychology and do researches about the way people feel when they go through cancer. Cancer has affected my life in a big way. Going through breast cancer at the age of 29 was not a big deal for me when compared to how I felt losing my sister, Mom and friends to cancer. Cancer changes people completely and they emerge something different from the experience. For past fifteen years after my cancer experience, I have counseled and met many survivors and learned a lot about surviving cancer. I would like to further study the feelings and experiences of people who have been through the ordeal. May be I can do something about the way people can deal with cancer. Not only the survivors but even the family of the people who go through cancer need emotional support and help. My own experience will add to my learning experience. These are the things I want to do for myself with or without the extra two hours I may get in a day. I am brave enough to finally go against what everyone expects me say and say what my heart feels at this moment. The two hours I get will sure be the exclusive ‘ME’ time. I feel I have done justice to others but not to myself. So 'NOW' it is time to do something for myself and feel "There, I have done something I cherish in my life". Imagine you had an account in bank. Each morning your bank would deposit ₹86,400 in your private account for you to use it freely. However, everything that you didn't spend during each day would be taken away from you. What would you do in such event? You would off course try to spend every rupee wisely to benefit yourself and people around you. Each of us is in possession of such a magical account in bank though we can't seem to see it. The bank is our life and the account is of time! Each morning we receive 86,400 seconds as a gift of life, and when we go to sleep at night, any remaining time is NOT credited to us. What we haven't lived up that day is forever lost. Yesterday is gone forever. Each morning the account is updated with new time, but the bank can dissolve your account at any time.... without warning. Death is always lurking around the corner. Time is worth so much more than the same amount in rupees. Change I'd good. I need to remind myself of this too. Beautiful! I am so much inspired by your blog Simone... You are one of those people who made me realize the importance of self. I find it easier to spend time with my self the older I get, but also if I think of any second of some qualitytime with my self. In one way, you can have quality time with your self all the way, all the time, you just do some things that need to be done, that doesnt mean you dont have quality time with your self? So I think it all depend on how you look at it.. Thanks Magiceye and Ranting Indian. Ege - Doing something we love just for the sake of loving is spending quality time with oneself. I also consider the time I have spent with my children very precious and memorable but this is something I want to do for me selfishly. Wish u all the very best! Nice write-up!! Thank you Mani and Sujatha. Actually the chores became difficult after the radical masectomy I had to undergo due to Breast Cancer. simply superb penning. the worth of time in expressed such simple way. Very Well Written and All the Very Best. But you know what, never mind the contest, never mind 2 extra hours - try and squeeze some for yourself somehow and pamper yourself - You deserve it! HI Farila, loved your post, seems like we know you personally know, envious of you being a good baker coz I can hardly bake. I loved the way you have summed it up at the end, exactly my thoughts, no matter how much time you have, its how we use it that matters. @ Pooja - Thank you Pooja.. You are absolutely right when you say that it is how spend our time which counts in the end. This applies to everything, money, love, experience, wisdom, faith, religion etc. Just do it..live for yrself! Beautifully written mam! Its a joy to spend time with the Kids..
Maitreyee - It is not easy to live for self when we have kids we love .. very tough for Moms. DS - Every minute spent with kids are memorable. My kids have been very loving and good adding to my joy. Hi again :) I have check the tranalate button, replaced it with another one, so if you could check it and see if it works? Let me know how it works. I will let you know a little later about the translate button. Actually I am so glad that you asked about the profile pic. The sketch was done by my son as a birthday present for me this October.. His way of letting me know he loves and remembers me even though he is far away this year. We all need time for ourselves to rejuvenate our energy. Otherwise, we can't use the rest of our time well, whatever we do with it. Yet it's that most important time-for-self that so often gets shunted aside when some other commitment presses on us. I can relate to the washer story!! I just got a dishwasher installed, which also necessitated a lot of changes in my kitchen, after not having one for ten years. All the time, fatigue, arm pain, etc. that cancer treatment caused might have been lightened had I had one 3 years ago, but believe me, I am appreciating it now! I know how shocked Paula was with our style of living but this is common in India. The ladybirds are going to be happy about this development. Need to post it on the board soon. Better late than never... ;). Thanks for appreciating my concept. Hmm, sweet post, and I wish you should achieve your dream of PhD in psychology.. and your thought about bank with a new day is very beautiful.. All the best.. I want to fill up this post with thumbnails of blogs from all over the world, big, small, new, old, so we get to know other blogs and read more about other peoples life. I am sorry, by mistake my same comment has appeared more than once. I deleted some, but was unable to delete other comments. This is the first blog of yours I am reading...a great blog. The best is that eveyone can relate to what you have expressed..:) All the Best and Keep Blogging....:). Thanks for appreciating my views. It is different when you are young, but once you reach middle age you feel as though life is slipping away and for those who have not sidelined themselves, this comes as a big shock. Beautiful post with great pictures..Most of the time we live our lives for others especially women. Your struggles are an inspiration to everyone..Best of Luck.. Very interesting post and it is nice to know about your decision. I feel you deserve it. Thanks Anonymous and Cre8ive.. I am trying to be strong. super.. really nice write up.. congrats on winning..
What a lovely story to end your experiences with - the ME time is so important, but I still do not know how to alleviate the guilt. My happiness is always attached to family. Without them, I feel guilty and I feel I am not happy. I don't know who I am.. and what I can be. It has taken you so many years.. I know it's not easy. I hope one day, I reach there too.